Prime Minister Nguyen Xuan Phuc said Vietnam staunchly backs the central role the U.N. plays in ensuring global peace. 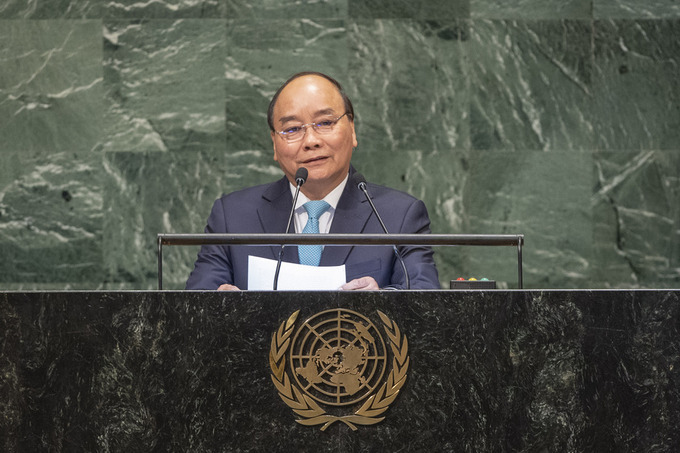 “Vietnam staunchly supports its central role in maintaining global peace and security, protecting and promoting human rights, and fostering development cooperation,” he told the 73rd session of the UN General Assembly held at the U.N. headquarters in New York. Speaking at the high-level general debate of the United Nations General Assembly Thursday, he also called for international collaboration in solving problems facing the world today. Phuc noted significant achievements in recent years thanks to global cooperation and development, such as the adoption of the Convention on the Prohibition of Nuclear Weapons, United Nations reforms, advances towards Millennium Development Goals and the 2030 Agenda for Sustainable Development. The U.N. has become a true symbol of global solidarity, Phuc said. Talking about Vietnam, he said that as a party to 16 free trade agreements, the country enjoys free trade relations with almost 60 major countries and partners worldwide. Vietnam hosted the 2018 World Economic Forum on ASEAN and it is working towards realizing the 2025 Vision for the ASEAN community, he said. On regional peace and order, Phuc said international disputes should be settled by peaceful means in line with international law and the U.N. Charter, stressing that the dispute concerning the South China Sea, known as the East Sea in Vietnam, should be addressed on the basis of the 1982 U.N. Convention of the Law of the Sea as well as on the principle of safeguarding maritime security, navigation and overflight rights and freedoms. He also noted the value of international cooperation and assistance in Vietnam’s progress towards sustainable development, international integration and poverty reduction. While scientific and technological breakthroughs as well as globalization are creating opportunities for unprecedented economic growth, the world is also facing new and immense obstacles, he said. Power politics, the use or threat of force and the rise of unilateral measures still threaten global peace and stability, while injustice, inequality, climate change, pollution and poverty persist. “No single nation can singlehandedly address the enormous global challenges,” he said, stressing that common efforts and collaboration of all nations are needed. The international community should uphold “dual responsibility” in which each nation and individual should take additional responsibility for addressing global issues. Mankind’s progress is measured not only by technological advances, but by peace and prosperity; even the smallest opportunity for peace must be cherished and nurtured. “The voice of small nations and the aspiration of the disadvantaged need to be respected, heard and shared,” he said. He also called for stronger high‑level cooperation between the U.N. and ASEAN. PM Phuc also met with leaders of the U.N. General Assembly, Secretary-General of the U.N. on the sidelines of the event. He also met Thursday with U.S. companies. He spoke to them about investing in Vietnam in the Industry 4.0 era. Vietnam is actively campaigning to be elected a non-permanent member of the U.N. Security Council for the 2020-2021 term.